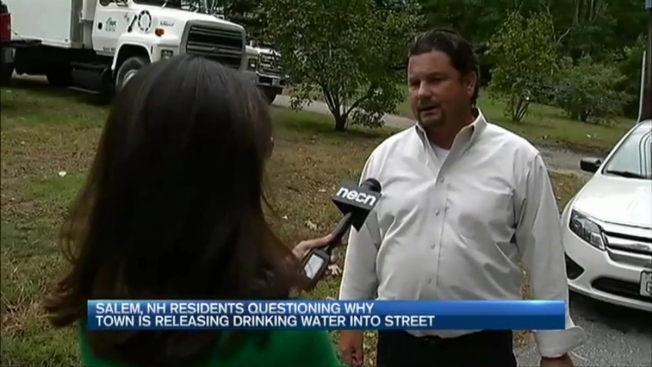 Residents in Salem, New Hampshire: Why Is Town Pouring Out Drinking Water? Residents on Howard Street in Salem, New Hampshire, say there's some irony to the timing of the town's latest project in their neighborhood. "There's 100,000 gallons of water going down the street and I have nothing to water my lawn with," Brian Regan explained. A total of 500,000 gallons of water will drain from the town's water tank, flowing down the street past brown lawns and right into a storm drain. It is being emptied so workers can paint it next week. "We are in a drought, and yet there have been five days of constant stream of water," Andrew Watrus said. Water restrictions in town have all but banned outside watering and the fines are steep for residents who violate the policy. Roy Sorenson, the town's municipal services director, admits the timing of this project isn't ideal but it's necessary. "It's unfortunate that we are in a drought, but this is a situation that the maintenance of the tank is first and foremost because this is an important part of our infrastructure," he explained. The work can only be done in the spring or the fall and in order to paint the tower, it has to be cleared of all equipment. The town currently leases space on the tower to four cell carriers and their lease with those companies conflicted with doing the work this past spring.